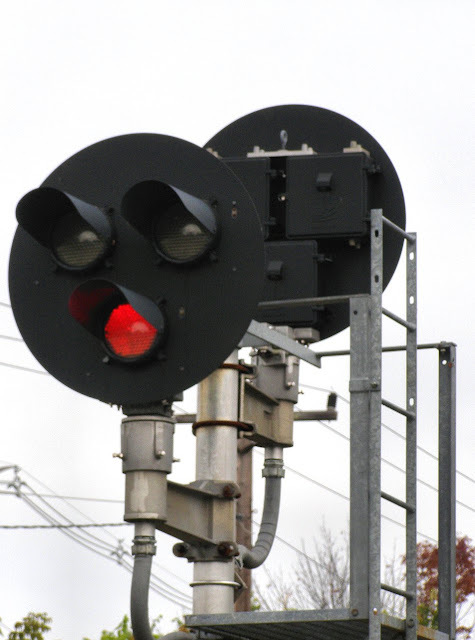 A lot of people like to throw the term "G Head" around as a generic reference for signals that have a circular target surrounding a triangular arrangement of three signal lamps. 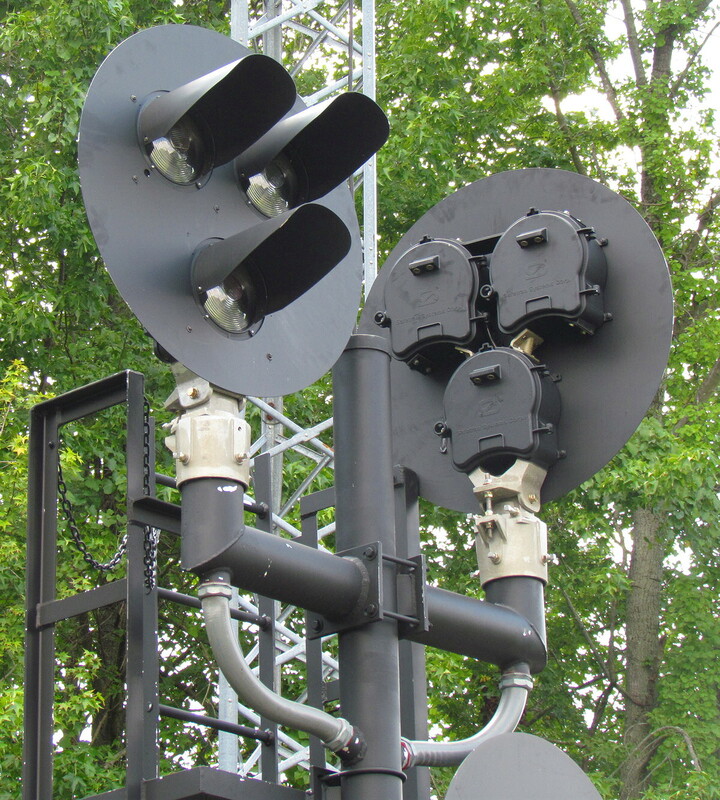 Also known as target signal, target color light, V light or tri-light, this style of signal doesn't really have a good name so people tend to gravitate to the professional sounding "G Head" moniker. 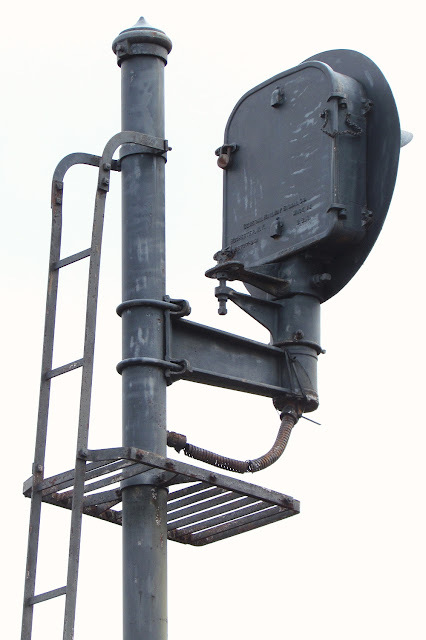 However, instead of being a generic term for that style of signal, it is actually a specific model of signal produced by the General Railway Signal corporation. 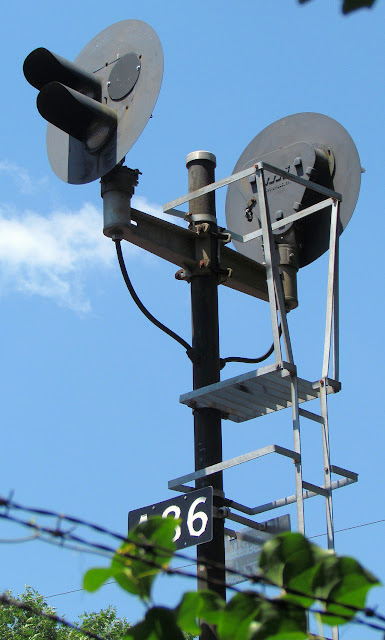 You can't even say that it was the dominant producer of said signal type as US&S had their own competing products that tended to be purchased by railroads US&S bias towards. As time went on even more producers entered the market so using G Head without any regard for the manufacturer is not only imprecise, but also inconsiderate to the actual brands involved. So below is a quick field guide to tri-light signals to help you tell the G Heads from the Generics. First up is an actual GRS Style G color light signal. Note the partly rounded lamp housing and the GRS brand spelled out in words. 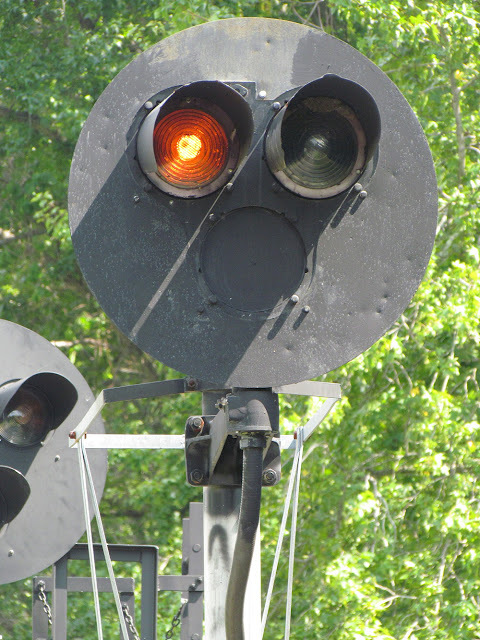 These were made popular by the New York Central railroad, but were also heavily employed by the Rock Island, MoPac and others. US&S responded with a couple of models. 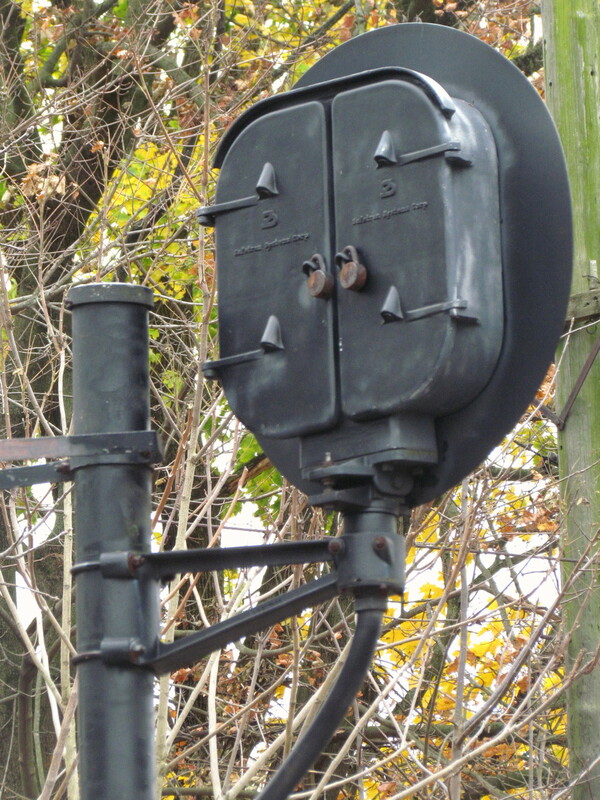 Their first attempt, the Style TR, used a compact, three section lamp housing covered by a single detachable backing plate. These are becoming quite rare, although Amtrak installed a bunch new at Chicago Union Station in the 1990's. 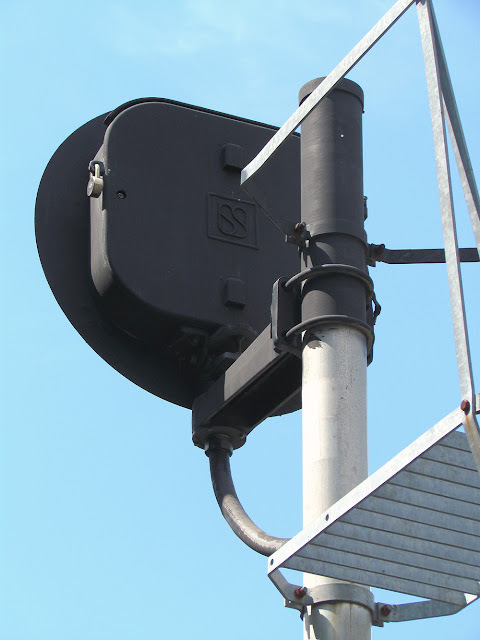 US&S later updated this style to be more like the GRS G-Head with a single piece lamp house. Christened the CR-2, it was a favorite of Conrail and other northeastern commuter railroads that were willing t pay more for a brand name. Of course Safetran couldn't help but make a knockoff. Dubbed the NR (I think), it did show some innovation by having a split door on the lamp house. Of course even at Safetran prices railroads can't be bothered with purchasing large cast iron signals so to accommodate them, Safetram offers a V target configuration for its ubiquitous scallop shell modular signal lamps. 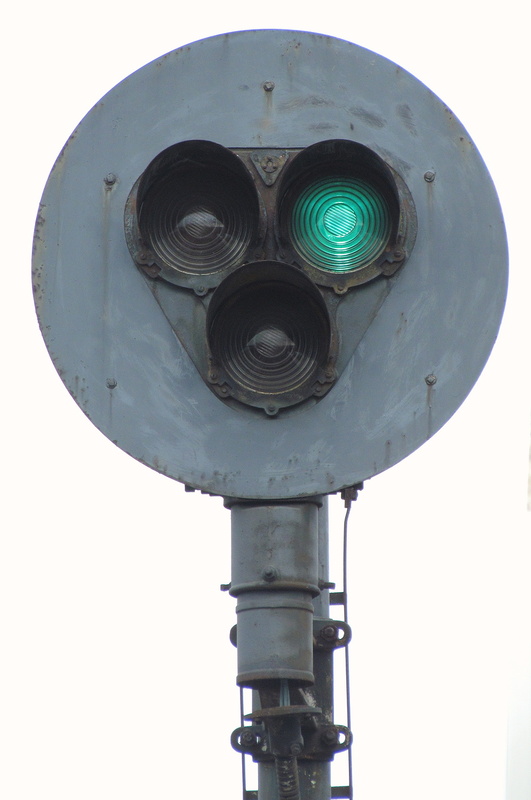 This produces a large gap in the center of the signal target, which is the easiest way to identify this style of hardware from the front. I mentioned that other suppliers jumped on board back in the 80's and 90's. 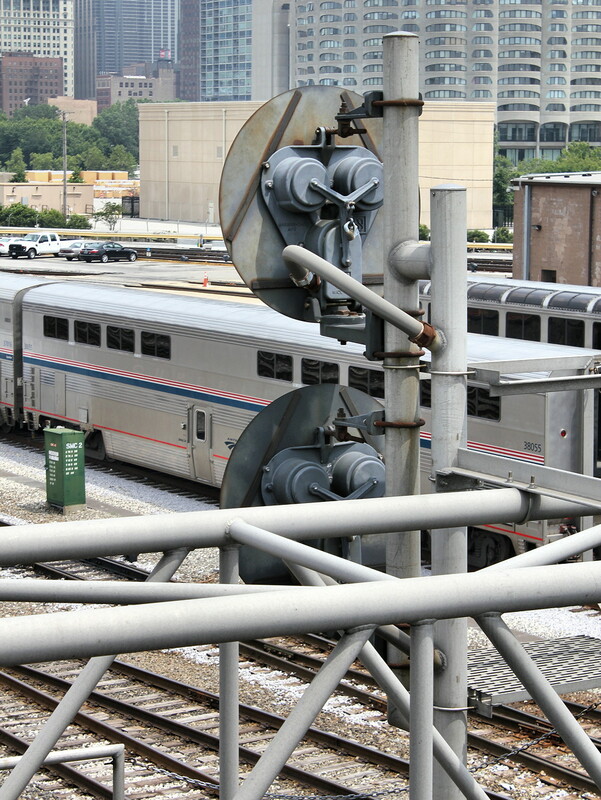 This triangular single housing model was made by an outfit in Louisville, KY and was purchased by Amtrak for its 90's color light needs. 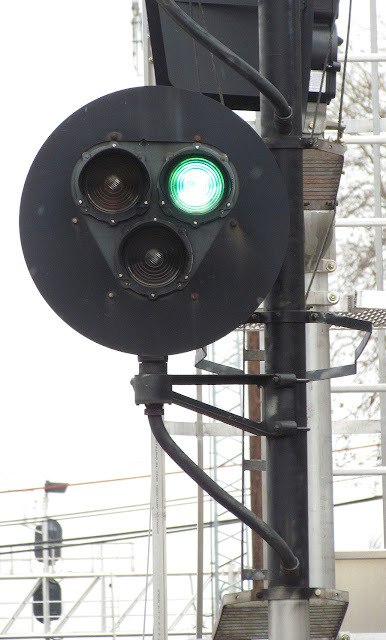 A decade later, this boxy LED modular Safetran knockoff is popular on Amtrak related projects throughout New Englande. Of course there are a few others in the V arranged modular lamp category, but I think you get the point. 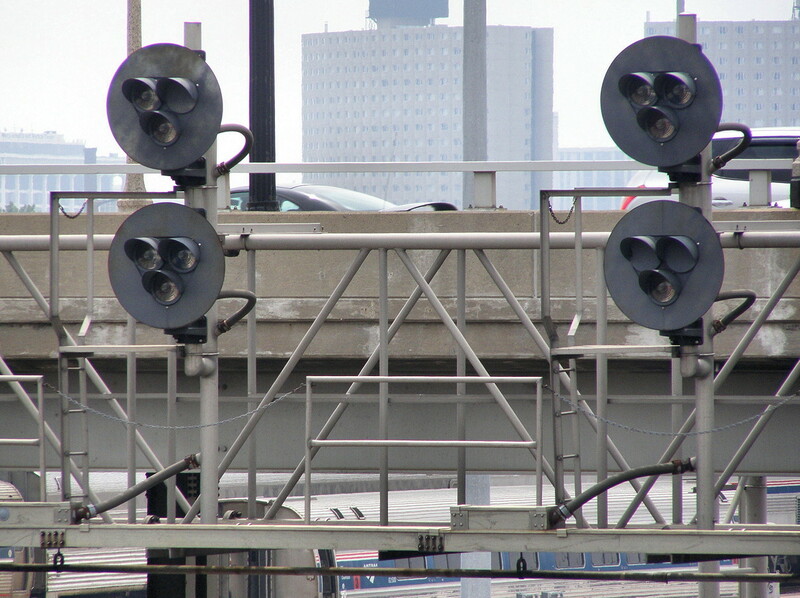 Hopefully you've learned something and will be able to correctly give every style of tri-light signal its due. Got to say Jersey Mike I really appreciate your blog. Keep up the good work!